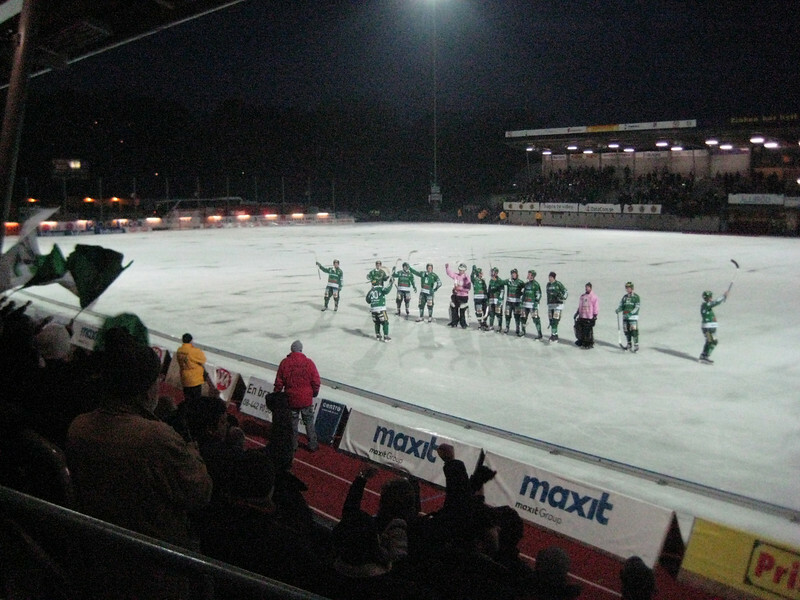 Sweden from the Cheap Seats: Bandy! Bandy! Bandy! orange golf ball (well, that's what it looks like, anyway) instead of a puck. 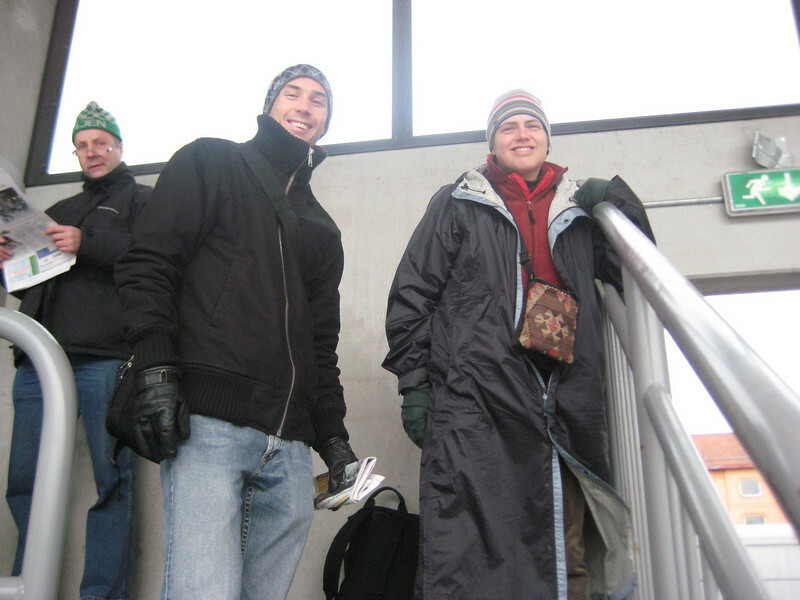 Anyway, we had been planning on going to the finals, possibly with a group of Jennifer's coworkers. Due to a little scheduling mix-up on our part though, we sort of double booked next Saturday, so we're not going to go. Yesterday, though, N., who had been talking about arranging a department outing to the final, offered instead to take the two of us to one of the semi-finals, which was played today in Stockholm. He even offered to drive, making it a very easy trip indeed. 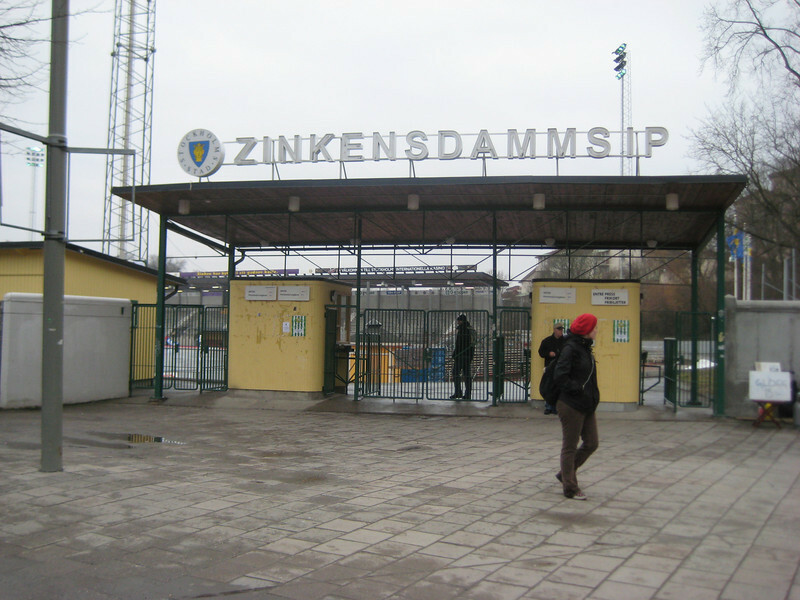 So, despite the dismal overcast skies and threat of rainfall, we hopped into N.'s car this afternoon and hied towards Södermalm and Zinkensdamms Idrottsplats, storied home of Hammarby Bandy. Traffic wasn't too bad, so we got there with a little time to spare. N. dropped us at the stadium and went off to find parking (no parking lot, you have to fend for yourself), and when he got back we decided to drop into the little grill outside the stadium entrance and have a sausage and some fries before we headed in. N. had warned us in advance that there are no seats at Zinkensdamms IP, just raised standing platforms, but we were there early enough that we pretty much had our pick of spots, so we headed up into the back and got places next to a rail for something to lean on. 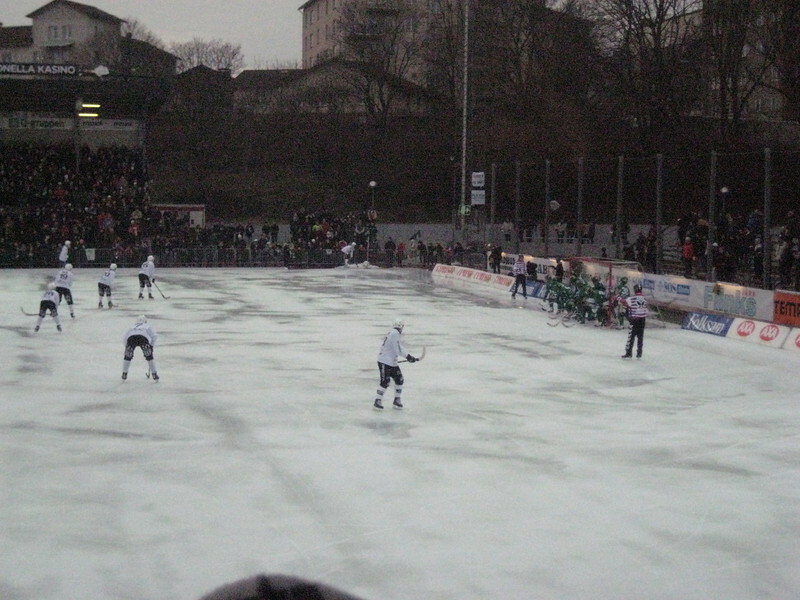 The weather actually turned out to be pretty cooperative—5° and no rain, which is positively balmy for a bandy match. 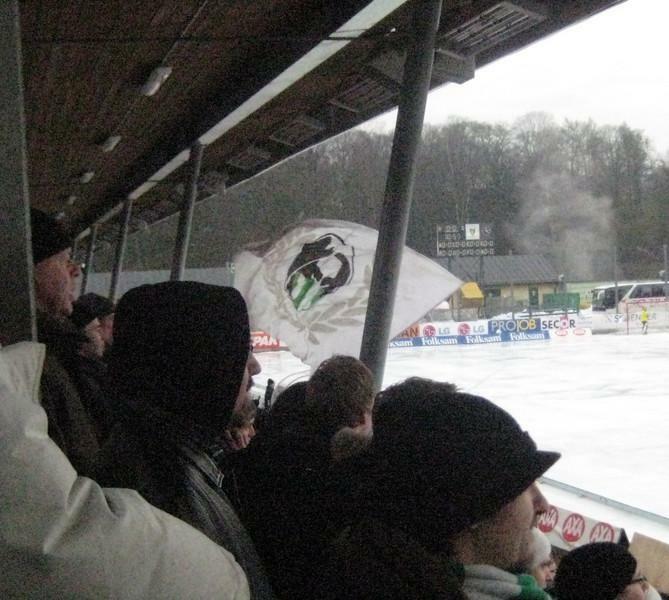 "Hammarby! Hammarby! Hammarby, Hammarby, Hammarby! Hammarby! Hammarby-y! Hammar, Hammar, Hamm-ar-by"
or occassionally "Heja Bajen!" ("Bajen" is the team's nickname—it is meaningless in Swedish, but allegedly it's a joke about how Americans mispronounce the team's name. I don't get it.). The first half started a little slow, but after a few corner kicks and an indirect kick or two (I'm just going to use the soccer terms to keep things less confusing), not to mention some really bad offsides calls, Sandviken was up to a 1–4 lead by the 35th minute. At this point, Hammarby abruptly woke up and scored 2 more goals, ending the half down 3–4, so we broke for half time on a pretty positive note. No thanks, I drove to the match. N.'s coffee was just coffee, though, as he had indeed driven to the match, and Sweden's drunk driving laws are no laughing matter (a single drink with dinner is enough to put you well above the legal limit). Oh, I almost forgot the half time entertainment. 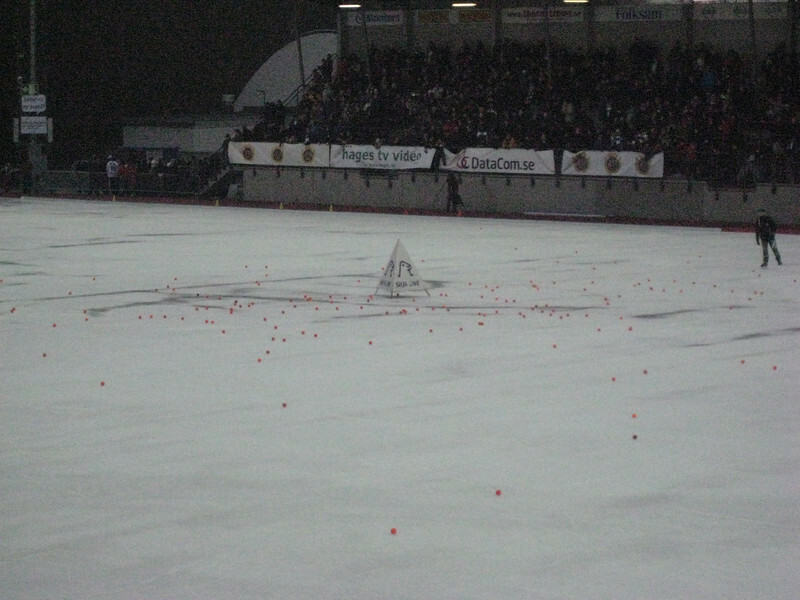 As soon as the players were off the ice, one of the ball boys (you have to appreciate a sport where the ball boys have to wear full face masks) brought out a little cone and put it on center ice, and then the crowd began hurling bandy balls out towards it! 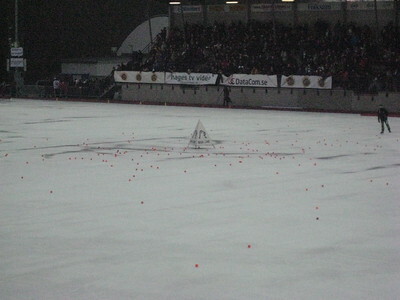 This was apparently the explanation for the lads with buckets of numbered bandy balls we had passed on entering: you buy a ball, and whoever gets theirs closest to the cone wins a car. Now I'm sorry I didn't buy one. With the second half the singing returned. There was also a lot of banner waving and some drumming, and I believe someone had a flare at one point. Despite the crowd's enthusiasm, and a notably faster paced game, the second half didn't see much scoring right away. This was in no small part due to some excellent goal tending. 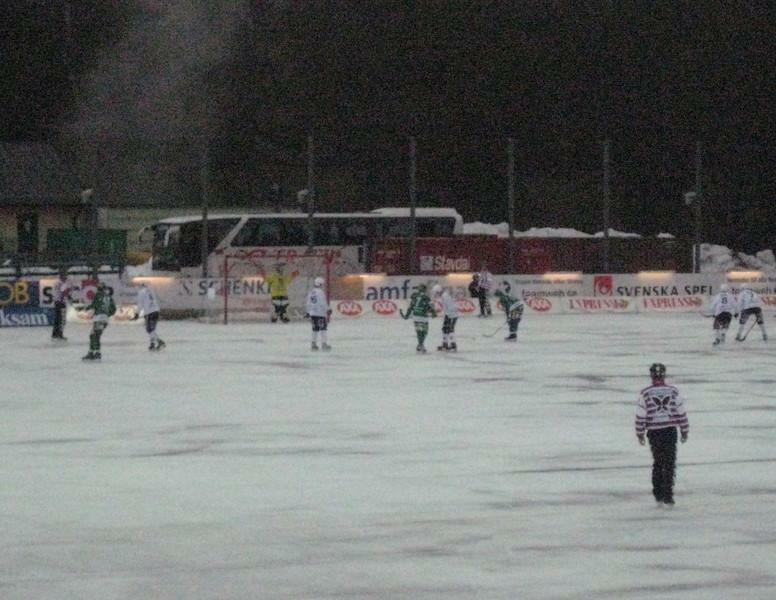 Unlike hockey, where the goalie's pads make him nearly as large as the tiny goal behind him, bandy goalies wear no visible padding, and the goals are about half the size of soccer goals. On penalty shots they stretch out their arms to try to block as much of the goal as possible, but it just doesn't look like they'd be able to stop much as that tiny orange ball goes whipping through the air. Still, the score remained the same until about the 80th minute, at which point Sandviken scored again (against the run of play this time, as far as I could tell). There was a brief ray of hope when one of Sandviken's players was red carded in the 83rd minute and sent off, leaving them a man down. A couple of minutes later, with another player in the penalty box, they were reduced to 9 on the field, but still managed to score once more in the 88th minute. Despite the almost certain doom this spelled for their team, though, the fans weren't reduced to grumbling, or leaving early (one or two did, but not a mass exodus by any means). Instead, they started to sing louder. By the 90th minute, when Hammarby did manage to score one last point for honor, the singing was echoing off the local apartment blocks, and when stoppage time ended and their season was over, the fans just kept singing, completely drowning out the Sandviken victory celebration. In fact, the only thing that shut them up was when the team captain came over and raised a hand for silence, so that he could lead he team in a cheer for the crowd. Then there was some more singing as folks filed out, and one of the fans passing us said something wistful and shrugged and shook Jennifer's hand as if to say, "Good season." Honestly, it was all more than a little touching. Awesome flag! I want one. But after hearing the song, I don't think anyone should complain any more about Florida State's tomahawk chop.